The Kellyn Foundation is a 501(c)(3) non-profit corporation with a mission to develop, support, facilitate and implement programs that encourage family and community physical and emotional wellness. We focus on healthy lifestyles with positive outcomes that can be sustained and taught to future generations, while helping to reduce the individual, family, community and national chronic disease burden. 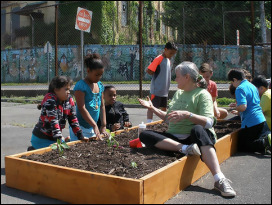 ﻿Working in local ﻿school districts, Kellyn Schools educates our youth utilizing school gardens and fun, interactive classroom programming to encourage healthy lifestyle choices. Delivering fresh, local healthy food from "Farm to Neighborhood", in combination with nutrition programming, cooking demos and chronic disease screening, the "Eat Real Food" mobile market is on the road. Intensive intervention programs that empower families to change to a healthier lifestyle with the guidance of a medical professional and ongoing group support. In our schools, organizations, and neighborhoods, Kellyn Kitchens uses local "Real Food" to educate, train, and encourage families to create healthy, delicious meals.